Pictured are representatives from leading manufacturers, organizations and publications, along with members of the P&E Wing Advisory Council, at the P&E Wing Manufacturer Council Breakfast during the 135th AES Convention in New York. Photo Courtesy of The Recording Academy®/Clyne Media Inc. © 2013 Photographed by: Corey Walthall, Clyne Media, Inc.
SANTA MONICA, Calif. (November 5, 2013) — The Recording Academy® Producers & Engineers Wing® Manufacturer Council Breakfast was held on Saturday, Oct. 19, 2013, during the 135th AES Convention. 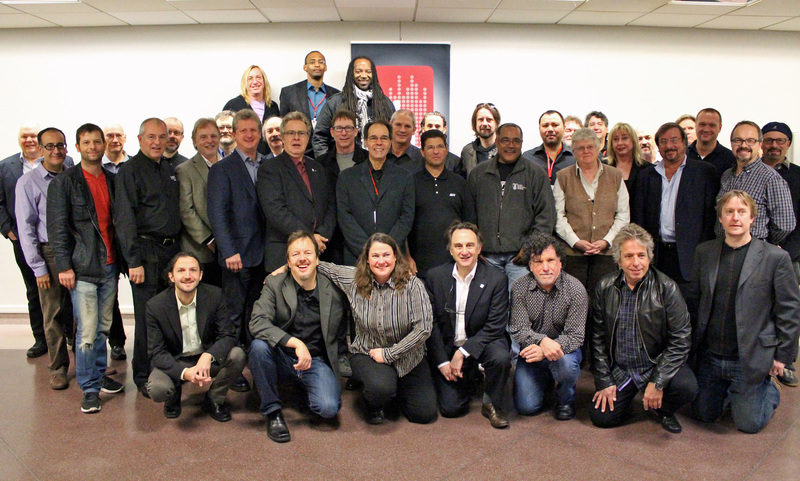 At their biannual meeting, the group of industry leaders — who are dedicated to the advancement of sound quality and to the overall growth of the professional audio industry — shared ideas and discussed issues with the goal of raising awareness about the importance of high-quality audio, legislative wireless white space and broadband issues, music streaming bit rates and other topics of mutual interest to pro audio manufacturers, retailers and the producers and engineers who use their products. Representatives from the following manufacturers, organizations and publications were in attendance: AKG®, API, Apple, Audio Engineering Society (AES), Audio-Technica, Avid, Electronic Musician, Euphonix, Fraunhofer, Focusrite Novation, Genelec, GC Pro, iZotope, JBL®, Lexicon®, Manley, M-Audio, Melodyne, Mix Magazine/New Bay Media, Music Producers Guild (MPG), PMC, Prism Audio, Pro Sound News, Radial Engineering, Royer, SADiE, Shure, Sonnox Ltd. and Waves Audio. Also in attendance were members of the P&E Wing Steering Committee and Advisory Council: Chuck Ainlay (Co-Chair Steering Committee), Chris Bell, Mike Clink (Co-Chair Steering Committee), Vincent Di Pasquale, Dave Hampton, Stephen Hart, Scott Jacoby, Leslie Ann Jones, Glenn Lorbecki, Bob Ludwig, Gavin Lurssen, Brian Malouf, James McKinney, Michael Romanowski and Dan Workman. Photo Caption: Pictured are representatives from leading manufacturers, organizations and publications, along with members of the P&E Wing Advisory Council, at the P&E Wing Manufacturer Council Breakfast during the 135th AES Convention in New York. Photo Courtesy of The Recording Academy®/Clyne Media Inc. © 2013 Photographed by: Corey Walthall, Clyne Media, Inc.